Nigeria Gists: Cultural Diversity in Nigeria: A Blessing or a Curse? Cultural diversity is a term commonly used to describe the society with people of different ethnic origins, which is manifested in their languages​​, the way they dress, art, and other traditional practices that are either similar or very different from each group. These traditional practices are highly valued and maintained with great admiration among people of ethnic groups. In Nigeria, for example, when it comes to dressing the Hausa/Fulani of the North is identified with the starch-ironed fez as a cap. In the western part of Nigeria, dominated by Yoruba ethnic group, people generally sew cap in a long style which neatly folded when worn on the head. On the other hand, in the eastern part of the country Igbo are known for their red cap, which is traditionally worn (but mostly) the title right. 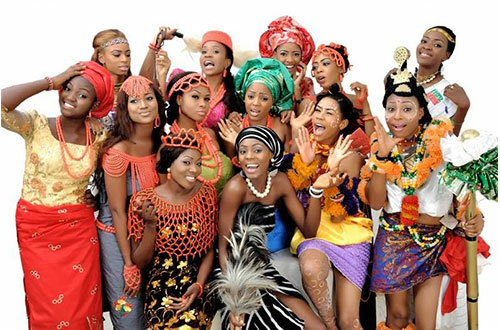 Other minority ethnic groups in the middle belt region of the TIV, Ngas, Ida, Nupe, etc., also have unique cultural attributes that help identify cultural roots, when they appear in public. On the other hand, differences within ethnic groups have existed for a long time. Even in the history of Nigeria, one can agree with the writer of it is cultural or ethnic differences that polarize the ideology that drives the indirect rule during the colonial era to be successful in the north and the south failed. Also, it is a manifestation of such differences that people in southern Nigeria's demand for independence in 1958, when the northern representatives said they were not ready. After independence was finally achieved in 1960, many ethnic groups showed tendencies of secession. Some of the secession move some ethnic groups lead to a full blown civil war, while others took to dialogue to achieve peace and development in these areas. Nigeria as a nation was created out of pure colonial enforcement, to achieve control of people and resources within the maximum limits carved by colonial sub-entity in Africa. This, however, made ​​her peoples (tribes / ethnic groups) to be confined together in the 'fate'. Destiny in the sense that the differences inherent in so many groups contributed to the crisis: the cultural, political, as well as the socio-religious ground. Many Nigerians recognize this fact, including Amod (2008), which states that: "We (the peoples of Nigeria) has survived as a nation and as a people united by fate and faith in God's glory bright, prosperous future for our beloved and blessed country Nigeria." This means that although fate has brought together people of Nigeria, his faith in God will make them survive over the odds to bring as a result of differences within groups. But as Davis (2008) says, "Fate, as we know it sometimes lies beyond our means for understanding the surface at the right time in our lives," Well, fate befall us (Nigerians) with the reality of staying / living and working together like one big family for more of our people realize their dreams. However, room, living and working together does not make Nigeria one, for there are so many differences that still keep its people apart. For example, religion has remained one of the major factors that contributed to the disunity of the Nigerian people. Another factor of division in Nigeria against ethnic groups in the policy. Trend policy is still divided along ethnic lines. It is common for ethnic groups that feel marginalized by the policy leader who is not from his land. In this way, the north do not feel safe with the leadership in the south and vice-versa. When it comes to politics, the ignorant masses can easily coined or cajoled to accept a political bias attitudes of politicians believing that it must be someone from their ethnic group, which will bring about positive changes in their community. Nevertheless, there are common areas of similarity in most cultures, which explains that the people of Nigeria have a common origin and hence, they are capable of understanding each other. But two things are essential in multi-cultural and highly diverse society: Similarities and differences. While the similarities in cultural practices of groups to bring harmony in society and promote peace among people, the existing differences among these tribes / ethnic groups is sometimes used negatively by selfish minds against the unity and peace in society. Nigerians and the people in any culturally diverse and ethnically mixed society must be able to maximize the opportunities for strengthening the "unity in diversity", rather than manipulation of diversity against the unity of their various companies, for selfish purposes.